Grind the almonds and combine with the cornmeal and flour, parmesan cheese,salt and pepper. 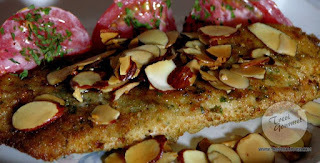 Sprinkle the lemon juice over the catfish and coat the fillets thoroughly with the almond mixture. Place the fillets on a baking sheet with spreaded olive oil and bake at 400F for 8 minutes, or until cooked through. Place almonds in nonstick pan and saute for 7 min in olive oil or until almond became slightly golden. Serve FLOUNDER hot topped with golden almonds.